I was poking around the various small business online accounting sites today researching our next Online Banking Report and thinking about which service would suit our business, given that Microsoft is pulling the plug on Money. I was already familiar with Outright.com (a Finovate 2009 presenter; demo video coming soon), FreshBooks, and LessAccounting. 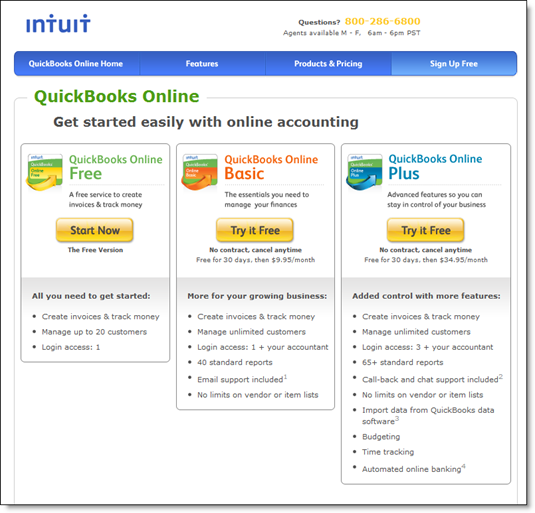 But I was completely surprised by one contender in the free category: Intuit QuickBooks Online. All four online accounting companies offer free versions and premium fee-based options (note 1). Consider linking to them from your small business resource center. For extra credit, develop a co-branded version you can offer your customers or negotiate discounts for the fee-based versions. 1. Outright.com is currently free for all users, but says it is working on value-added, fee-based options. 2. For more info on the small biz space, see our Online Banking Report: Small & Microbusiness Banking (June 2004). Note: Anyone who purchases the 2004 version now, will automatically receive the newer version when it’s published later this month.